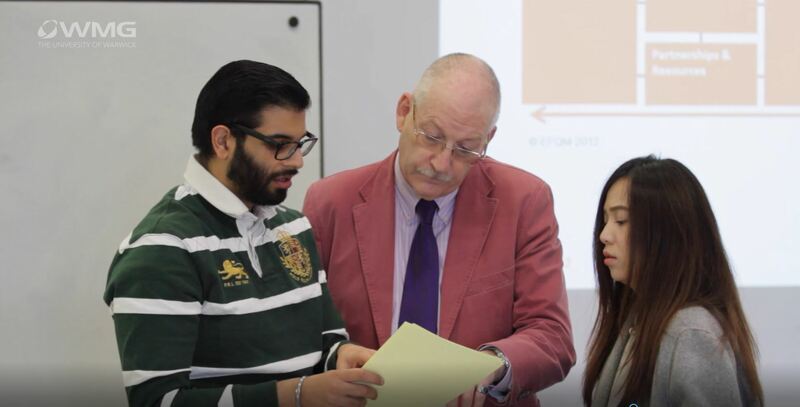 The framework for the Management for Business Excellence degree is the European Excellence Model, created to help organisations develop towards the achievement of sustainable excellence. MBE is an innovative Master's degree in Management, designed for those who want to become effective leaders and managers of business excellence in industry. It is suitable for high achievers who want to be challenged in the way they think about business management and problem solving. The course is all about understanding how organisations work; it takes a holistic look at organisations, the inter-relationships between departments within them, and how to optimise the use of available resources. Upon graduation, you’ll be ready to progress the capabilities of organisations, by making decisions on improvement, and by understanding how these decisions will affect departments within the business. Designed to deliver a detailed understanding of the philosophies, strategies, processes and techniques that enable change and deliver business excellence, this course will provide you with a distinctly different learning experience to what you will have previously been used to. The style of learning is active. You will make choices about what you wish to learn and you will decide how best to achieve your learning objectives; all of this will be facilitated by our expert MBE course tutors. Teamwork plays a central role throughout the course. By working collaboratively with your international colleagues, you’ll develop a rich, global perspective. Through classroom simulations, you’ll generate credible and practical solutions to real-business problems. Most importantly, you’ll learn to think critically about topics and issues that come to the fore; challenging views and growing both as an individual and as a leader of business. Using a range of blended learning approaches, including e-learning, students are provided with a rich learning environment in which you will develop a deep understanding of content. The programme is supported by tutorials and seminars to discuss and explore web-based content. You will need to choose one elective module from the full module list, which should be chosen to supplement your course modules above. Elective modules are subject to availability and restrictions apply. You are required to pass nine modules in total for this MSc course. MBE coursework will be formatively assessed. This means that you will be required to pass your modules, and you will be given feedback on the strengths of the work and areas for improvement, but no mark will be awarded. Follow these links for recommended elective modules and their thematic links to the European Excellence Model which provides the framework for the degree. For Management of Business Excellence, the research-based project allows further integration of understanding. The aim of the MBE learning environment is to help you to develop critical autonomy and achievement of deep learning. This course is rich in applied exercises guided by the MBE tutor team, all of whom are acknowledged experts in their fields. This course makes widespread use of e-learning to provide a rich learning environment, respond to all students' needs, stimulate teamwork, and develop a deep understanding of content. Support is through tutorials and seminars to discuss and explore web-based content, and leads participants to understand contexts and real-world application of theories, principles and techniques alike. See here for more information about the course structure. In order to meet our academic entry requirement, you should have obtained the minimum of a UK second class honours degree (or equivalent) in a variety of disciplines. Typically students will have a background in engineering, business management, finance or economics, but MBE is open to graduates from any academic background. It is important for you to have a good understanding of the course and learning environment before you make your application. Please read as widely as possible because MBE is a very distinctive programme and you need to demonstrate a good understanding of this to be offered a place. A Personal Statement (which answers five specific questions - see above), which can be included in the online application. Graduates of this course could expect to find employment as managers and leaders of business development, new product development, manufacturing, quality assurance, human resource management or customer services. With further experience, you would expect to attain a key executive role and be responsible for leading strategy and policy. You will have the skills and knowledge necessary to benchmark organizational performance against world best-in-class and the ability to drive corporate transformation and improvement, leading to international recognition of the enterprise for all aspects of corporate performance including, market share, customer satisfaction, employee development and financial results, to name but a few.